South Wales Boat Show - The Biggest Marine Event in Wales! The 2010 South Wales Boat Show will be held on Fri 17th, Sat 18th & Sun 19th June 2011 Margam Park, near Swansea, and is the biggest marine event in Wales. The 2008 Boat show was hailed as a great success with over 340 craft on display and thousands of people enjoying the wide range of marine attractions on offer. The 2011 Boat Show promises even more, with a large number of exhibitors already planning to return, the show is well on the way to exceed their target for the fourth show at Margam Park. Also, from 2008 North Wales will have its own proper Boatshow, it will be held at the Veynol Estate just out side Bangor just off the A55 with great road access to all. The show will be over 3 days like the South Wales Boat Show. and will be held from the Friday 17th -19th June , it will be on a blue print of the South Wales boatshow, with the very successful come and try on the lake, a road show, and plenty of things for the family to do. The Biggest Boat Show in Wales has a new venue at the Prince Of Wales Dock SA1 South wales. After three very successful shows the show has decided to move to a new home. Yamaha Jet Ski's, Arvor, EcoSea, Cobalt Sportsboats , Sealine, Trickett Marine, Maxium and many more. Debuts will be made by the Raptor Racing Boat from UK Hydroslides with a tough revolutionary design which will make it stand out from the crowd. The Rave from Windrider will also be on show. The Rave is the fastest production sailing boat in the world at present. B.W. Sport Boats the official importer of Italian Blue Star will be holding their Premier Uk Launch at 3rd South Wales Boat Show. It will be the first opportunity to see the range of high Quality Italian boating exhibited for the first time in the UK. Select Yachts will also be attending the show for the first time with a Cornish Shrimper. This delightful Traditional gaff rigged craft is Ideal for exploring the whole of the coast of Wales and is great fun for the whole family to sail and extremly popular round the whole of the UK. With all the new and existing exhibitors and with even more Family Things to do , its going to be a great family day out for all the family, with a family ticket for only £15 at the show there's lots to do with a Family Fun Fair, Neath Port Talbot Council are providing 40 tons of sand to create a beach play feature with a pirate ship!, Free boat trips with the return of "come and try" on the lake where last year over 500 people tried Watersports, many for the first time! Aimed at both young and old, they even have a Surf Simulator and marine themed Paint Ball too! With exhibitors including, The Welsh Build B25 from Custom Mouldings who launched their new trailer sailer here at the show last year, along with two new companies to the South Wales Boat Show including Character Boats who will be bringing three fabulous sailing day boats to the show along with Swallow Boats a Welsh boat builder. Swallow Boats have been designing and building small traditional style boats since 1995. In recent years their range has expanded and now includes several large day boats, which they build to order in their workshops on the banks of the river Teifi near Cardigan. They are planning on bringing at least the BayRaider, and the newly named Toppit 12, a design they are producing in conjunction with Wales Watersports for the London Boat Show. 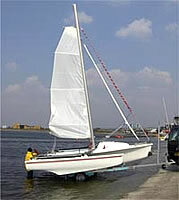 They are also hoping to bring along a Storm 15 and a Storm 17, as well as possibly their Winsome pedal boat. Ribs are also playing a large part in the make up of the show with several Welsh and other UK companies attending including Cambrian with Rib Eye, Picton Boats, Witty Marine, Pembrokeshire Sports Boats with Revenger Ribs and new exhibitors Rib X who will even have craft afloat on the Lake at Margam. Pembrokeshire sports boats have confirmed they are launching the New Ocqueteau 22 twin ruddered trailer sailer, this will be the first show in the UK for this craft and Ocqueteau have produced a radical and pretty, easy to sail yacht designed to be simple to sail 4 berth coastal cruiser. South Coast Power Boats are proud to be involved with the third South Wales boat show. They would like to introduce their exciting range of Brazilian Sports Boats and Fast Fishers all powered by the latest outboard technology the Evinrude ETEC giving outstanding performance unbelievable reliabilty and incredibly low maintenance . These complete ready to go packages starting at £9450 including engine and trailer are quite simply unbeatable! MiniCat-UK will be making their UK Show Debut in this years South Wales Boat Show at Margam Park. 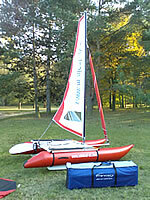 The MiniCat is un ultra lightweight catamaran that fits into a bag. This ingenious and unusual little dinghy can be assembled in around half an hour and even less to dismantle. It weighs under 40kg and can fit into the back of a car. which would save the weekend boater endless roof rack or trailer complications. There will be demonstrations of their unique CAT in a BAG, from bag to Catamamran in 30 minutes. All three MiniCat models will be at the show, STANDARD - SUPER & the SPORT. Dolphin Boats will be bringng to Wales for the first time the Sasauka 660 this craft can be both easily trailered and sailed she is a 6 Berth family Sailing Cruise Yacht. her total length is 6.60 m ,she has a weight of 1250 kg . New Boat prices are from £19,950 inc v.a.t. Astus trimarans will also be exhibiting at the South Wales Boat Show. Their boats have been designed to offer maximum pleasure with minimum hassle. Their folding floats give you access to narrow slipways and monohull berths in marinas and their light weight make them towable even by a small car. Easy to handle and rig, they are friendly boats that you will want to take to your favourite sailing spots all year long. But it is on the water that the personality of these lovely trimarans really shows: thanks to their multihull design, they pick up speed even in light winds and will give you endless exhilarating sailing. Their stability and wide cockpit make them ideal to take children or friends on board. South Wales Boat Show are also pleased to confirm the show also has had bookings from the Pembrokeshire Marine Technology Centre who run extensive boatbuilding courses, Celtic Maritime Connections, the West Wales Maritime Heritage Society, The Federation of Welsh Anglers and many more from all over the U.K.
For more information and to keep updated on who's attending keep a weather eye on the web site www.southwalesboatshow.co.uk . Coming in July to the Vaynol Estate near Bangor www.northwalesboatshow.co.uk full press release DUE IN TWO WEEKS! !